There are certain truths that translate to every sport. Hamstrings get tight. Hip flexors need stretching. We can never get a strong enough core. And we need to take time to breathe and relax. There are hundreds of yoga poses (asana). Each one has a purpose. It is important to structure your yoga practice around how your body is feeling on that particular day and on the activities you do. Tune into your body and listen to what it is telling you. If it hurts, don’t do it. Getting injured is no fun! The following seven poses work to open the shoulders, hips and lower back, loosen the hamstrings, build core strength and bring about relaxation and rejuvenation. Also known as crescent lunge, these moves open up the hips, build strength in the core, legs and glutes and also improve balance. Lunges can be practiced with the back knee lifted or lowered to the mat. Focus on lengthening the spine, drawing the tailbone to the ground and lifting the pelvis. Feel centered in the front foot. Arm positions can be stretched up (as shown) drawn together in a prayer pose with palms at the heart, reaching behind the back palms facing each other or any other option that feels good. All the while, focus on drawing the shoulders down away from the ears and relaxing the neck. Triangle pose has so many benefits. For athletes, we like to focus on opening the hips and chest. A block placed at the inside of the front foot is a great prop to work on opening those hips. The back hip will turn backward as the front hip draws inward. The shoulders stack and the chest opens. The legs are strong, kneecaps lifted, and both feet are firmly planted into the ground. Lift up toward the sky, feeling the obliques working. Keep the neck relaxed, and turn the gaze to keep the neck feeling good. Boat pose is a wonderful core strengthener. It targets those deep abs that are so hard to get at but do so much to keep us strong. The focus here to stay in good alignment in this pose is to keep the spine long and the chest lifted. Try to avoid rocking onto the tailbone and imagine a ball of yarn tucked under the chin to keep the neck in line with the spine. The legs do not need to be lifted. The feet can be planted on the floor. As you progress in this pose, the feet can be lifted, and the legs may even want to be straight. Downward Facing Dog is such a powerful pose. There is so much going on here! Stretching the back of the legs and lower back, strengthening the shoulders, upper back and triceps and opening the chest. This pose is great after any workout to hold and breathe, allow the legs to release, maybe bicycle the knees back and forth. 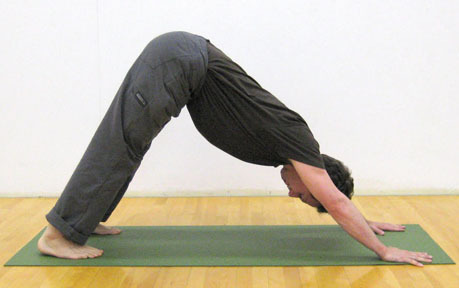 Some common problems in this pose are hunching of the shoulders and rounding of the upper back. So make sure to draw the shoulders down the back, away from the ears and lift that tailbone to create length in the spine. The legs don’t need to be straight. Play around with this pose by bending the knees toward the ground and lifting the tailbone higher, seeing how much height you can get. Press evenly through the hands, especially through the thumbs and inside of the index finger, which have a tendency to lift in this pose. Feel as if you are pushing the floor away and driving the hips to the sky. Cobra pose strengthens the back, shoulders, legs and glutes, while opening the chest. It is a good counterpose to downward dog and is part of the Sun Salutation series. This can be practiced as a low cobra, using no arm strength, only abdominal strength and back strength to lift the upper body off the ground. To deepen the pose begin to straighten the arms while drawing the shoulder blades together keeping the heart lifted. Always press the tops of the feet into the ground. Sometimes all we need is a little child’s pose and all will be right with the world. 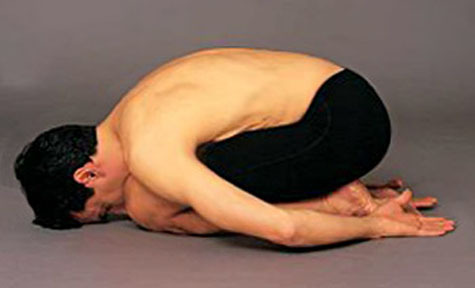 This pose is so restful and relaxing. The longer you spend in it, the deeper you’ll go. You can really let yourself decompress in this pose. Allow the upper body to melt into the thighs, as the hips sink into the heels. The forehead can rest on the ground, or you can stack the palms on top of each other and rest the forehead on the hands. This is typically the final pose to any sequence as it enables complete relaxation. Lie down on the back and let the feet fall open to the sides. Thighs turn outward and relax. Palms are face up, and the arms are long along the body. Shoulders are relaxed and away from the ears. Eyes are closed. The back of the head rests evenly on the ground. Focus on the breath and allow the entire body to relax. A nice meditation to completely relax the body is to do a slow body scan, relaxing each part of the body as you mentally travel from one end to the other. Stay in savasana for at least five minutes. It allows for deep relaxation and an absorption of the benefits of the yoga poses previously practiced.